After yesterday's exertions we elected to have an easy day so offed to Carhaix for a return visit to Decathalon where I made some more impulse purchases. 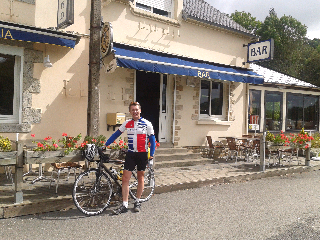 So only 50 km today, via café au lait and biere stops. Last night at Huelgoat so we are off out for a good feed. Another day at the seaside. The wind blew us there up hill and down to the north Brittany coast where we refuelled with Breton Far (flan). The return was not so much fun into a 30 mph headwind for 50 km. Legs completely knackered now. Put arm warmers and jacket on and set forth. Took jacket off, took arm warmers off and put jacket back on. Took jacket off, put arm warmers back on. 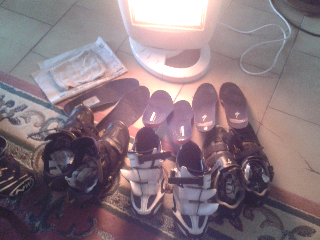 Took arm warmers off. Put arm warmers on. Rolled arm warmers down, rolled arm warmers up, rolled them down, rolled them up. Took arm warmers off and put jacket on. Took jacket off. Arrived back home. 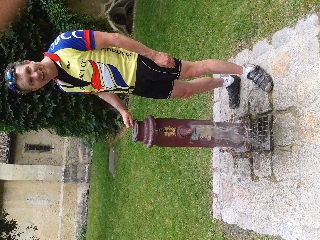 This in beteen a ride down to Chateauneuf du faou and along the Nantes-Brest canal for a few miles. In fact it hardly rained, just threatened to constantly and the sun shone simultaneously with showers and 25 mph wind. Subsequently had a great meal of potage de lgumes, moules et frites, and tarte tatin at the Hotel du Lac. 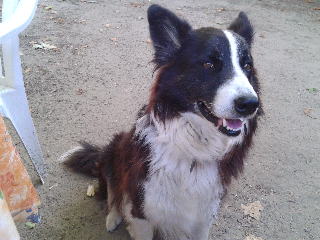 There is a triathalon here tomorrow so we have entered JJ in the super-vets category after preparing him with a special high carbohydrate meal accompanied by 'secret supplements' - fingers crossed he will not be stripped of his title several years hence. Today the plan was to go to the beach. Light rain when we left, 10 miles up the road in the teeth of a gale and downpour we turned back and are now drying out with the heater on, watching the force 8 gale and driving rain while playing cards, eating snacks and trying to delay the first beer for as long as possible. 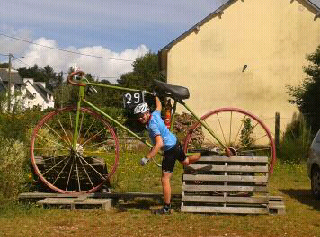 100 km tour round central Bretagne. JJ wanted to go to the Decathalon store in Carhaix to buy some cycling gloves so we went there first - no gloves to be had but I came out with a travel towel and MdaC with some sunglasses. Thence up the road for a cafe/beer/cola break with lunch where we got talking to an English chap who was restoring houses out here for the last 10 y. 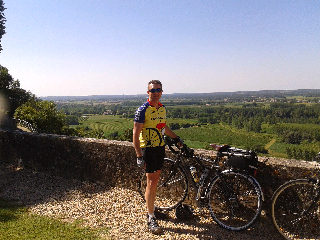 Next we went to see the Gorges du Corong but didn't see it because we couldn't be arsed to cycle down the lane to it. No matter, after many lumpy miles it was worth it to see JJ being drafted by a combined harvester. 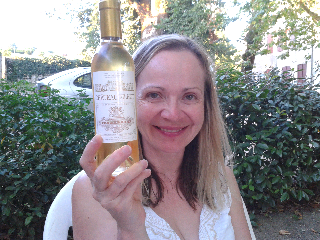 Settled down with a glass of Sauternes ce soir. Once again we avail ourselves of the cheap accomodation in Huelgoat. 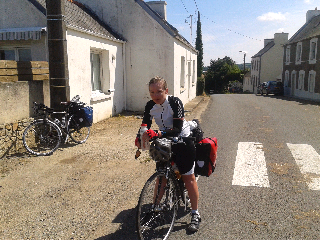 An overnight crossing from Plymouth saw us arrive early and cycle to Morlaix for the traditional cafe au lait at the 'Europe' and then the remaining 15 uphill miles - now why is it that it's all uphill on the road and the route on the voie verte is uphill on the return? 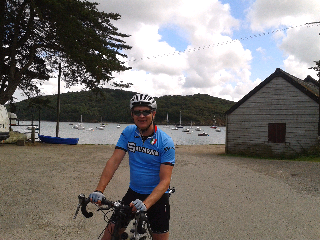 So, we arrive at the lake only to see Terry the butcher cycle up to meet us from his holiday gaff in St Brieuc (70 miles). You can see the routes we took ,while staying near Bordeaux and cycling back up through Brittany. We clocked up the 500th mile as we rolled on to the return ferry. 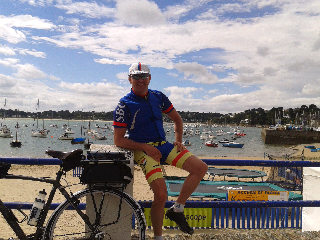 An easy last day from Morlaix to Roscoff via St Pol de Leon for the customary cafe stop. 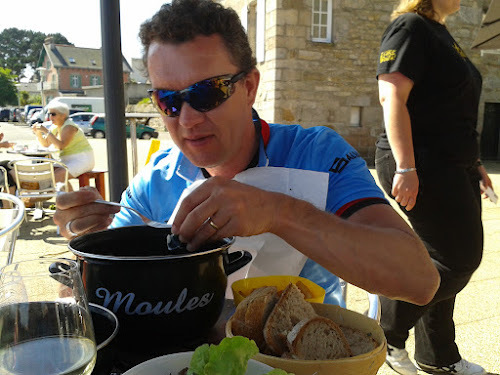 We passed a leisurely lunch at Roscoff where I partook of the traditional moules et frites washed down with a nice glass or two of the vin de maison. The trip home was notable only for the sighting of a whale off the port astern (apart from 'Magic Dave' who was still at it). Arrived home to find e house still standing though smelling of stale beer and laundry - oh we'll, back to being a house elf. 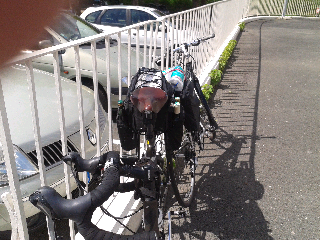 We left Guingcamp for the penultimate leg to Morlaix. Now, if you are like me, you will have had those cycling moments when youknow that you've made the wrong turn but carry on regardless - such was the case at Luzivilly . . . You know the score; the road forks and' confused by the french proclivity for numbering two quite different routes with the same designation, you have to decide which to take in that split second before necessitating the ritual of having to stop, unclip, waddle to side of road and then get going again. So, I went left, and instantly knew it was the wrong choice when I saw 'the wall' of Luzivilly which I laboured up with cursing and swearing, noting all the while the numbers painted at the roadside as if counting down the climb, and the great big white line painted across the road at the crest (more of that later). Now, I know that you are waiting in breathless anticipation for me to relate what happened to S . . . Well, I think she's still back there somewhere . . . No, I jest, and this is the most astounding part of the tale - she got to the top WITHOUT GETTING OFF. Chapeau to S.
The expression on S's face is less triumphant than it might have been given that I had just informed her that there was an alternate route around the hill! Monday was a (sort of) rest day so we cycled in civvies along the Nantes-Brest canal down as far as Lac Guardelan, which is the man made lake that joins the various rivers that make the canal. The next day we set off for Guingcamp, an interesting old town, where we have checked inbto a rather nice Ibis hotel. On arrival I spent a jolly 20 min in Le Pharmacie publicly discussing possible treatments for a 'cycling related ailmnent' which had become uncomfortably apparent, which concluded with 'vous devez avoir un presctiptione pour la'. So on to la centre ville where S was detrrmined to have a traditional Breton crepe. The creperies opened at 7 so we were forced to kill time at various cafes around the town square, but it was worth the wait and we enjoyed some tasty and filling fare. 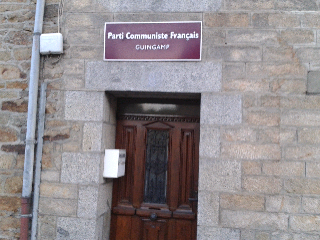 Returning to the hotel we passed the communist party HQ of Guingcamp - I thought of calling in brandishing my copy of New Satesman but thought better of it remembering S's Mail on Sunday smudged fingers (which she professes to get only for the TV guide). S has determined that she will NOT put on any weight during this trip. I can happily confirm a positive result because it has become apparent that S has morphed into the incredible shrinking woman and is now smaller than a candlestick and barely taller than an egg-cup. 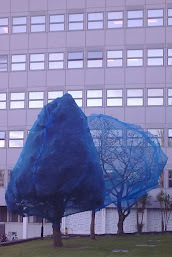 I have been remiss in updating the blog. 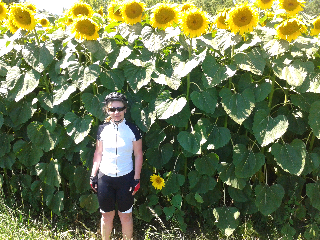 Day 10 saw us leave our gite and cycle to Bordeaux where we had an extensive lunch at cafe Tupina once more, before boarding the train for the 6 h journey to Vannes - arrived at 9 pm to the typical Breton weather of . . . rain. Checked into the Formule 1, washed gear and changed to go and eat in the restaurant next door . . . 'ferme à 21.30' . . . so we repaired back to the room for our remaining banana and vending machine coffee, and watched Jessica Ennis win the gold. The day dawned to more Breton weather, i.e. heaving it down. 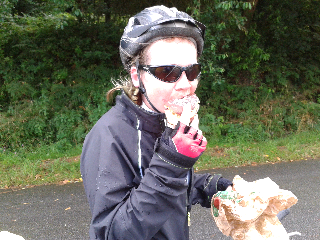 We sought our a patisserie (this being sunday) for breakfast cake to fortify us for the 50 lumpy miles to Lescouet-Gouarec. Now, I've said this before, S doesn't like lumpy and so it transpired once more, the only thing which got her the final miles being a giant bignet which I had foraged for lunch in Locminé but now donated to the cause - if Napoleon had access to such bignets on his campaign.in Russia he surely would not have failed because, apart from being highly nutritious they can provide shelter from the elements or in a pinch dehydrated to make sturdy buttons. So we arrived to the deluxe chambre d'hôte of Peter and Keith where we reside for 2 days to allow S to recuperate. So it always seems when on vacation in another part of the world, but I'm sure it's just as good in 'ole blighty' when the sun shines . . . errm, so not this year then. 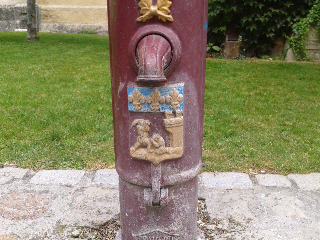 Anyway, we off back to Bordeaux tomorrow for the return train leg to Vannes and a cycle through the the 'partly showers' of Bretagne. 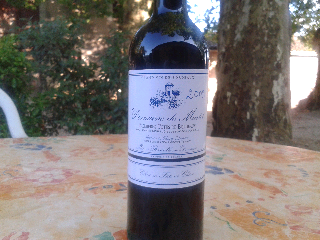 We will be quite sad to leave Domaine Martet: Monsieur Martet gave us a bottle of their own wine, produced on the premises from their vineyard, last night; sadly though they have stopped producing it, and it was a bottle from their last harvest in 2009 - what can you say to a lifetime in a bottle, but thank you so much! wasn't a comment liklely to garner me a Michelin star. Well, I scoffed mine and my friend scoffed most of S's so at least two out of three of us were happy with the nosh. So to Bordeaux. 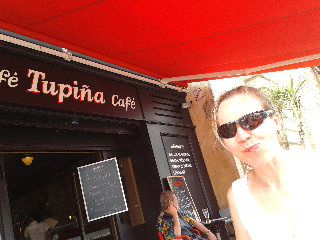 S was determined to have lunch at La Tupina, a fantastically good restaurant recommended by a friend at work. This involved a fair old trudge across the R. Garonne to la gare in Cerons so we set off at the crack of, togged in our 'going out' south of France style linen ensembles. Being super efficient I google mapped the route which said '59 min' to walk; no problem, allowed 1h 45 min, memorised the route and off we went . . . cut to edge of ring-road by the river . . .
Well, you get the idea. We passed the fella in the picture twice, separated by 30 mins of sweaty slogging, and got to the station with 1 min to spare, so all was well, and we arrived in Bordeaux sweating like Billy Bunter doing the ten tors, and made straight for the café. So, now to recce la restaurant. Google maps informed me it was not too far away, and indeed we fetched up at Tupina which looked, seemed, was in fact, a bog standard caf' . . .
S: are you sure this is the right street? S: are you absolutely sure? H: yes; look, I'll try my other gps . . .yes, all it checks out fine. Both: stuff that, let's find somewhere else. 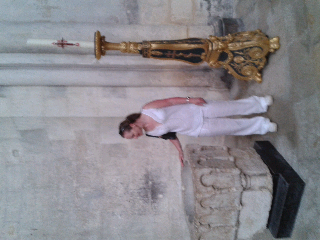 Cut to 2 h later of trudging round Bordeaux and getting close to lunch. . .
Cut to the approach from the other end of the street . . .
H: hey, isn't that posh looking place with the tablecloths, maitre de and braying hedge fund owning customer also called La Tupina?
. . . silence while we peruse the menu, never getting further than the €25 starters . . . So we had an excellent four course lunch at CAFE Tupina for €14 per head! Today we went to, well yes you guessed it . 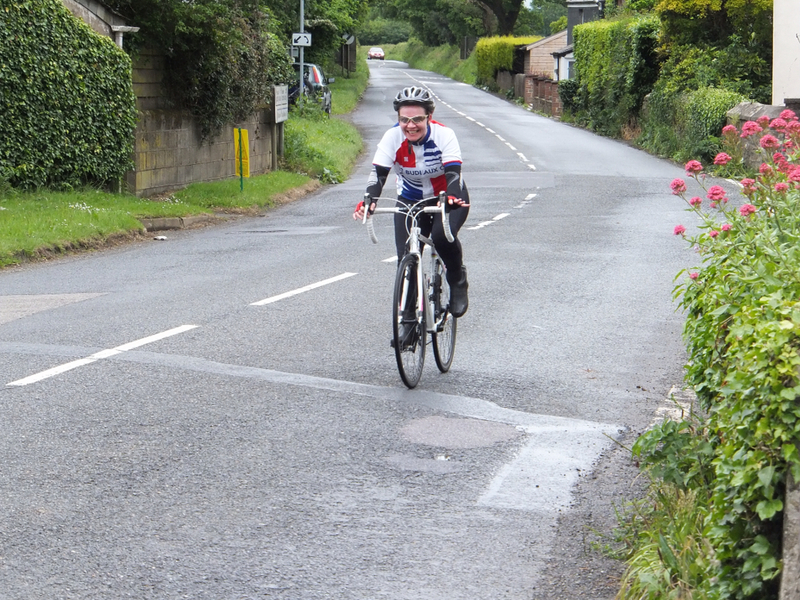 . . S decided she wanted to get the miles in, so off we went into the 'hilly' east. Now, I don't know about you, but my experience of the world by bike has taught me that Devon and Cornwall are utter murder compared to practically anywhere else, and so it proved once more as the rolling miles (or should that be km) through stereotypical France sloughed off the wheels like so much spent adder skin in the baking sun. Talking of which, it has come to my attention that S has at last learnt to draft properly, and spent the whole ride stuck to my back wheel like she was on one of those kiddy pull-alongs. First stop for the de rigeur café au lait was at Sauveterre; the place was packed with Brits and the adjacent table was host to two plaid shorted and rugby topped families (don't know where they parked the land rover) with kids in tow (avec plastic inflatable spider man) who would clearly prefer a water park in Magaluf rather than the Dordogne in 30 degree heat. So, fortified by the French equivalent of a custard slice (me) we carried on. 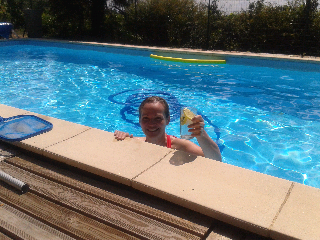 Anyhow, to cut a long story short on a relatively uneventful day, we did a good 50 miles and ended up back in the swimming pool to cool, now drinking one of yesterday's killer bouteille du vin. Off to Bordeaux by train on our rest day tomorrow. P.S. S has been bitten but I haven't - two-nil so far! Today we set forth into the Bordeaux vineyards, specifically the Sauternes and Graves regions on the west of the Garonne. Now, I've probably said this before but I like a nice glass of wine, but my hand normally hovers below the £5 shelf in Asda and rarely gets extended upwards unless the 'half price' sticker is in evidence. However, S was determined to visit a proper Chateau for le degustation, and I ran out of delaying tactics after passing the umpteenth chateau. Any of these might have had the best bottle of plonk in France but I didn't have a clue even after reading the book in the Gite. 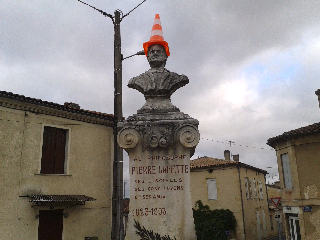 So, upon reaching the actual village of Sauternes itself, S hares off down a long gravel drive, which I half expected Sebastian Flyte to pull out on in his Bentley, past the chateau and thence to the caves. I can see the holiday money taking a hefty dent but am slightly bouyed by the fact that S professes not to like sweet wine, which Sauterne of course is . . . Cut to le gustation . . . So €14 lighter (for HALF a bottle) we say au revoir and on to the next place. On the way I did my good deed of the day - female cyclists stopped at side of road, one (Italian on a Bianchi) with puncture, the other French says of her partner 'this is her first time'. . . what can a man do . . . asked S to hold the bikes while I gallantly advised on correct technique and impressed them with my big pump (S rolls eyes skyward). So onward to the next cave where repeat of the previous sees me 50 notes lighter on the day, but with some admittedly nice vin to have with our moules ce soir. Today was a day of rest after the travails of the journey. A good lie in restored some of our normal zest so we elected to go for a bike ride in civvies - for the un-initiated, this involves cycling in normal clothes and without a helmet (but, I hasten to add, not with a basket on the front). So we 'offed to Cadillac (whence the famous auto was named) but never got there because we passed a supermarché ouvert dimanche, so stopped off for essentials. Now, I don't know about you but I like a nice glass of wine; so does S, as can be seen from her photographic expertise so far. But, trying to figure out my appellations from my pays and communescand chateaux has defeated me, despite downloading an app for the phone . . . So I will henceforth resort to random sampling grom the €4 shelf, with occasional variegation up or down depending on the state of the holiday money. Off to the Sauterne tomorrow for degustation. An uneventful day of train travel. After about 2 h sleep (because the house next to the hotel were having their own mini version of the Quimper festival) we retraced our wheels up the 15% hill at 6.30 to catch the train to Bordeaux. Now this was a critical part of the journey; according to the guff the the train accepted bikes on a first come basis so I had prepared for mortal chain-ring combat in the rush. As it turned out we were first there so just got on. Cut to 7 hours later . . . Arrived on time and successfully negotiated our way out of Bordeaux with only minor wrong turns and swearing - as always the hardest part was getting off the platform. 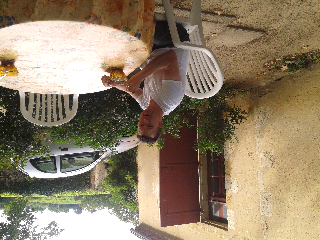 Lovely ride down to the Gîte where we have our own shady al-fresco dining area and use of the pool. The supermarché is 2 km away and so far no mosquitos - however, since discovering that it has been scientifically proven that S's O rhesus negative blood group is the mozzie equivalent of Chateaux Mouton Rothschild (which is coincidentally just up the road) I just have to cunningly ensure that there is the merest square inch of her flesh showing to redirect the bloodsucking hoard during the night - hence I awaken relatively unscathed. If you turn up at a French railway station and your train is listed as 'supprime' it doesn't mean that you will be getting an upgrade to 'supreme', as was my initial thought. No, rather, it means that the bloody thing is cancelled. 'We can always cycle there . . . ' I said to S . . . '*@/:&£?! <comment deleted>' was her reply. Luckily, I had planned for just such an eventuality and had arranged to catch an unnecessarily early train to allow for unforeseen delays. So, panic over and we embarked for Landerau where would have to change for Quimper - a single carriage affair in which everyone had a suitcase because they were off to the festival, so you can imagine that two fully laden bikes were welcome in the equivalent of the Taunton hopper during Glastonbury. No matter, the threat of oily chainring on shin was yet again the modern equivalent of the leper bell on public transport. 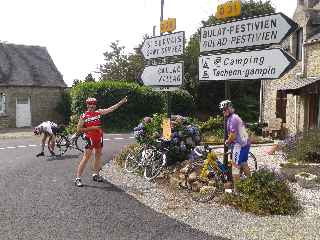 In the event we got off at Chateulin and biked the rest of the way to Quimper only to find the contra flow system contra flowing in a contrary manner due to the gendarmerie directing traffic away from the festival, and more specifically directing us up a 15 % hill . . . and then down the other side to the hotel for a zero sum gain. Early up tomorrow for the train to Bordeaux - let's hope they aren't having a festival. Allez Evans. So, the tour begins, without the initial mishaps of last year which started with a puncture before even leaving the front door; no, we had an incident free trip to the ferry in glorious weather (about bloody time) and watched the Sound retreat behind the wake of L'Amorique as we headed toward Bretagne in the company of 'Magic Dave', the resident children's entertainment. Now, why does ' . . . avec Magic Dave' not sound quite the same as ' . 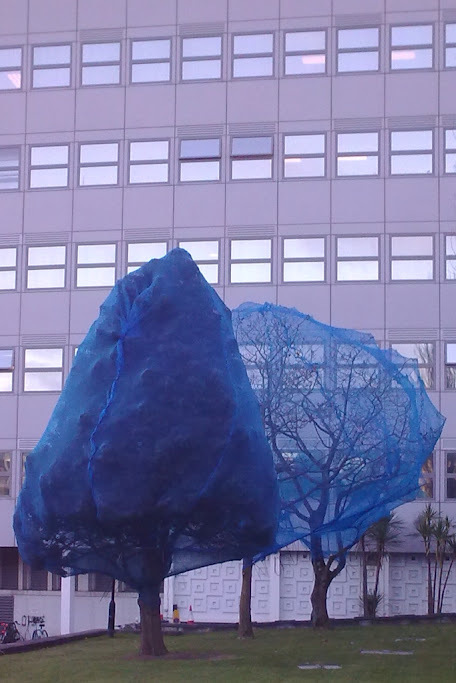 . . avec David Magique' - something lost in translation there I think. We met some Yogis on the ferry; Graham, Rachel, Dave Skinner (sporting his nu-skin look as a consequence of hi 'off' last week - good to see him on the bike in Hawaian shirt though) who were on a quick there-and-back to Roscoff with lightweight carbon bikes ( practically weightless compared to our Panzer tanks! but we are hard, we're St Budeaux!). So, to Morlaix and the traditional biere et Perrier in the usual cafe, and we even went to exactly the same restraunt as last year, but then we were absolutely starving and ran out of mental capacity to make any comestible decisions, so Spaghetti Carbonara it was with the raw egg reminding me of the salmonella scandal that embroiled Edwina Curry before BSE made any food-related scandal small beer (several puns there - answers on a postcard). But I digress. We have the 8.05 to Quimper tomorrow but I am trying to gauge when to get off and cycle, factoring in the likely lumpiness of the terrain because, as you know if you are a regular listener, S must be protected during the initial week, much like the yellow jersey in Le Tour, to avoid mishap and potential abandonment. The big task tomorrow is to stock up at the local patisserie before catching the train - food being priority premiere (or maybe deuxiéme . 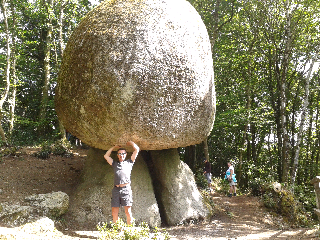 . . another stope at the supermarché perhaps?). Today the Summer arrived at last. The organisers of the 'Out and About' audax must have been doing the sun dance for it to so fortuitously shine on them this Sunday. We set off from West Buckland at 9 am and immediately into a hill of not insignificant gradient which had S off and walking before we'd had a chance to take the first sip from our bottles. But after she got her breath back and adopted my sage advice of 'recruiting the glutes' (which is admittedly anathema to the female cyclist, who is doing her utmost to lose them most of the time) she managed to grind up the remainder without too much discomfort. After the initial shock to the system it was pretty much all downhill to the sea - which got me a bit suspicious knowing that it would have to be paid for on the return leg. Stopped at a nice cafe but too early for the advertised bacon buttie, so waited until the next one for the tuna sandwich. We arrived at Seaton in pretty good time. The yachting fraternity seem to have made this a bit of a base, with lots of new housing on the foreshore and some tasty gaffs on the hill overlooking the sea - one modern mansion in particular has two wings and even a small lodge at the end of their drive (presumably for the mother in law)! We progressed through Beer but alas not able to have one this far from home so made do with another swig of electrolyte which tasted like it had already been through the system once. 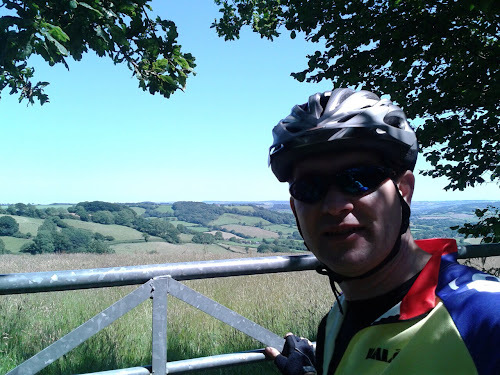 Now it was mostly uphill via Honiton and a myriad of Devon and Somerset villages, all with inviting beer gardens but no time to stop, partially made up for by a serving of beans on toast at the finish in West Buckland village hall. 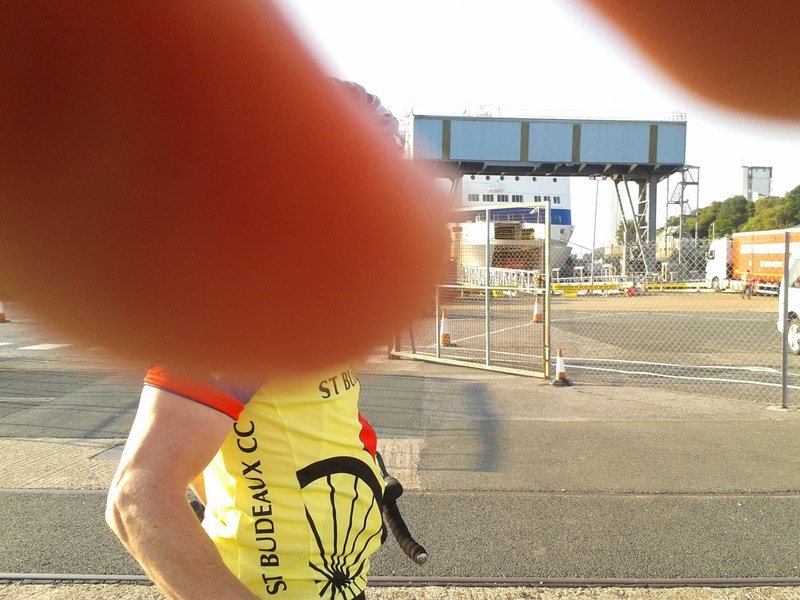 But not before I got the arse with S for apparently questioning my navigational skill - she should try cycling half the 70 miles steering with one hand while reading the route sheet on potholed country lanes and simultaneously cross-referencing to the gps . . . and they say men can't multi-task. 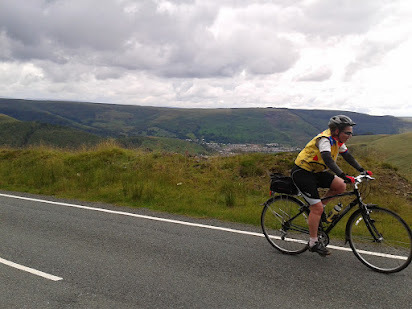 Preparation for this year's tour started in earnest this weekend when I treated S to a jaunt up the local hill on a visit to my parents and old stamping ground in the Rhondda. This was to get us into fine fettle for the upcoming travails in the Gironde where we would be weighed down by frequent quaffing breaks and possible the odd bottle stuffed into the panniers. 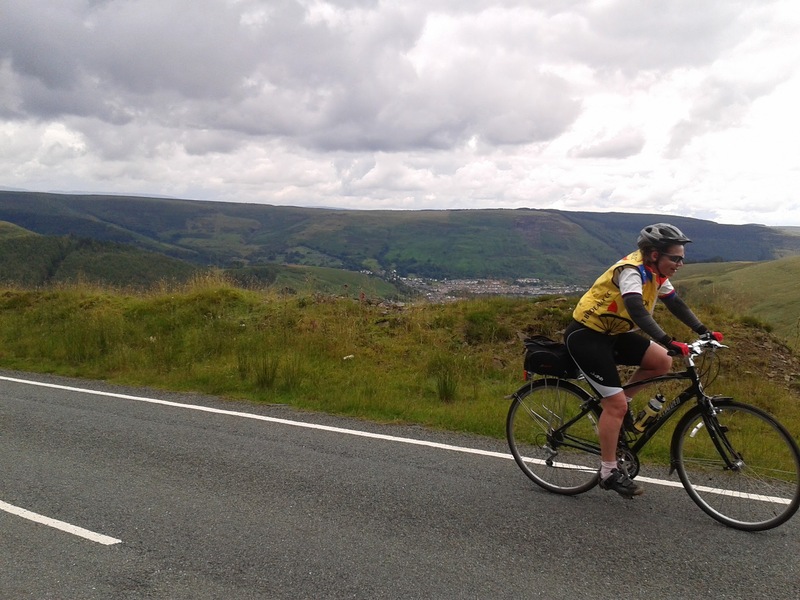 Needless to say, because I have related it before in this column, that hills are not her forté, however the drag up the Bwlch mountain on touring bikes with various weighty attachments was accomplished in relatively exemplary style. Near winter conditions at the top (in July!) precluded any lingering to enjoy the view so we set off on the descent into the Ogmore valley. You may be familiar with the picturesque seaside spot of Ogmore, but the top of the valley is a post-industrial mining town which elicits variable reaction ranging from 'what an effing dump' to 'quaint' to 'I'll never forgive Thatcher for f***ing us over'. 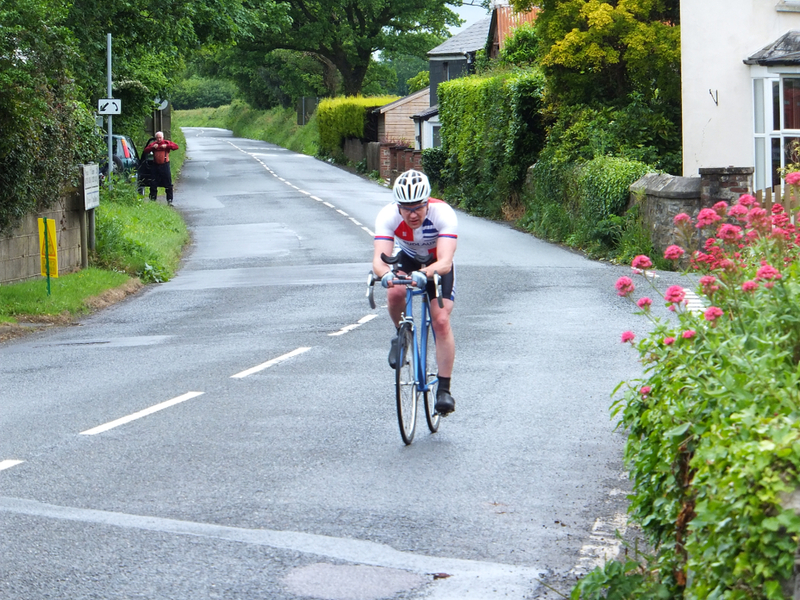 So we sped through the narrow streets to Blackmill where the downhill ends and it started to get lumpy. Now S doesn't like lumpy, she's more of a flat cycling type of cyclist - when the road goes up and down in quick succession her enjoyment takes a similar profile proportionate to the time taken to respectively increase or decresae her gravitational potential energy. However, I see it as my duty to inculcate her into the true cyling faith and look forward to the moment when she sees the light and her hill phobia turns into the bright-eyed religious zeal of the true believer who has learned to love the upward gradient. Some way to go yet on this evidence . . . Recently, S revealed t me that she has a bucket list, and one of the items on said list is 'Do a Time Trial'. So, not wanting to stand in the way of her do before I die determination (though it nearly was the last thing she did judging by her state at the end) I suggsted that maybe she could do the Club TT . . . and she rashly agreed. Now, if she knew anything about time trailling she would have chosen to do a 'Flat 10' or even a 'Flat 25', but no, she did our 'Hilly Sporting 16'. What can I say - I did it on a fixed wheel 85" gear . . . bloody nutter. 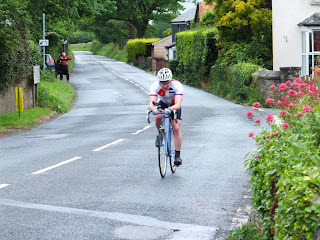 Anyway, picture show us time trialling the Kelly Bray course I did it in 44:51 and S got back well under the hour at 57:52, despite nearly stopping to puke all over the road. I quite enjoy the self-induced misery but S ' . . will NOT be doing another . .' (her words) despite me suggesting that it might be like childbirth and she will forget the pain by next year.